ADOPTA GEAR BOXES are Helical Inline Gear Boxes, designed to mount flange type I.E.C. Standard Electric Motors. Inline Helical Gear Boxes shown here are suitable for coupling to I.E.C. Standard motors. Foot Mounting. For the capacity refer to STANDARD GEARED MOTORS. Planetary Gearboxes With the aid of our highly experienced professionals, we have been manufacturing, exporting and supplying the optimum quality Planetary Gearboxes. We manufacture these gearboxes as per the prevailing norms and regulations of this industry. Further, we make sure to use the best quality raw material for manufacturing these products. Our offered gearboxes are made available to the clients at most competitive price. These Planetary Gearboxes manufactured by us are highly demanded in the market due to their following quality features: Sturdy construction Dimensional accuracy Precise design Durable Other Details: BEVEL HELICAL GEARBOXES are Planetary Gearboxes, designed to mount flange type I.E.C. Standard Electric Motors. Planetary Gearboxes shown here are suitable for coupling to I.E.C. Standard motors. Foot Mounting. 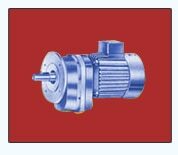 For the capacity refer to STANDARD GEARED MOTORS.